Two small bands of multicoloured embroidery sit in Mohammed Owaimer’s hand. “Each ribbon is a medal and each medal has a name,” he explains. “This ribbon is khidma mokhlissa, a medal issued by the Abu Dhabi Police as a reward for loyal service. This is khidma hassana, a good service medal awarded to members of the army. Mohammed isn’t a policeman, a soldier or even a sailor, but when it comes to the state, loyal service is something he understands. He is the founder of the inimitable Technical Scissors, Abu Dhabi’s largest specialist outfitter and a company that celebrates its 40th anniversary this year. “There are other suppliers, but for military uniforms, there isn’t really any competition in the UAE,” he says. This is not a boast, just a simple matter of fact. Mohammed, 65, last lifted a needle in 1985 but still describes himself as a master cutter. He learnt his craft from his mother, a famous maker of wedding dresses in Gaza, the place of his birth. Those employees include his eldest son and deputy, Maher, and second son Khader, who is responsible for quality assurance. They sit at the head of a business that now has more than 400 tailors, with branches run by family members in each of the seven emirates, as well as operations in Qatar and Iraqi Kurdistan. Thanks to Maher’s efforts, Technical Scissors is also making inroads into the potentially lucrative central and sub-Saharan African market as well. “People do not know us in Africa but they get to know us through our website. We make samples and we send them to people,” he says. Maher holds up a sample of one of Technical Scissor’s many “salminom uniforms”, a black, scarlet and gold ceremonial jacket destined for a military marching band in Chad. Abu Dhabi may have produced a growing number of internationally recognised brands – Etihad, Etisalat and Masdar among them – but few capture the essence of the emirate’s home-grown shopping experience as succinctly as Technical Scissors. Thanks in part to the mystery surrounding its idiosyncratic name and its distinctive window displays of ramrod-straight tailor’s dummies sporting sunglasses, dress uniforms and fatigues, Technical Scissors has developed a following that extends beyond its immediate customer base. There is even an unofficial Facebook fan site dedicated to the company. That is despite the fact that much of the store’s stock consists of “controlled items”, available only to members of the forces who are qualified to wear them. Technical Scissors’s wider appeal may be incidental to Mohammed, but expressions of appreciation and thanks line the walls of his small, mezzanine-level office above the Khalidya showroom. Among the many plaques and trophies is a certificate thanking the company for 30 years of continuous supply of uniforms to the Abu Dhabi Police. This sits next to a photo of Mohammed receiving the award from Sheikh Saif bin Zayed, Deputy Prime Minister and Minister of Interior. “When my father sees the police he is happy because he has made all the uniforms, soldier and officer, from A to Z,” says Maher. But the photo Mohammed keeps tucked out of view on the floor by his desk speaks most about his journey through life. It is of him at the age of 20, with glossy hair and matinée idol good looks, taken soon after he arrived in Abu Dhabi in September 1968 as a refugee fleeing conflict in Palestine, with his whole future before him. His first job was with another tailor in Abu Dhabi’s old souq, working as a civilian gentlemen’s outfitter. “Now it is easy to buy jackets and pants, but back then it was different and business was very good,” Mohammed says. Despite the fact that business was booming, it took him another four years to save Dh3,800 for a year’s rent so he could open a business of his own. 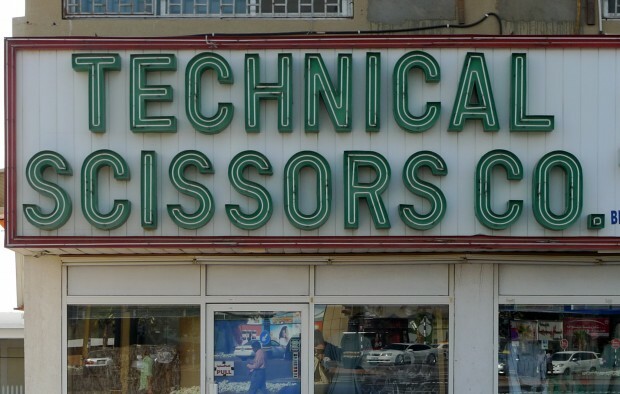 Technical Scissors was born in 1973 in a single room with a single sewing machine in Khalidya. Mohammed did all of the cutting and sewing himself and the company name from a tailor’s business he remembered in Gaza. His first big break came in 1980 when he won a contract to supply uniforms to Abu Dhabi’s Air Force, setting up a workshop inside the Al Bateen airbase and eventually recruiting 50 tailors from Pakistan. When Technical Scissors won a similar contract with Abu Dhabi Police, Mohammed had to establish a workshop inside the force’s central store in Al Mushrif. Thirty years later, 100 dedicated tailors work on the ADP contract full-time. Ensuring that Abu Dhabi’s armed and civil forces are parade-ground ready is a labour-intensive business. Not only does each officer receive four uniforms annually, each of which requires measuring and tailoring, but many buy extra uniforms to make sure they continue to look sharp throughout the year. Many uniforms worn by higher ranks also need to be completed by hand, with items such as a jacket belonging to a senior police officer taking more than a day to finish. As he walks around the firm’s Khalidya showroom, Maher cannot help but inspect the stock. As wool, silk and cashmere are to a traditional men’s outfitter, camouflage fabric, tactical boots, and military insignia are to him. As Technical Scissors’s procurement manager, he travels the world visiting new suppliers and makers to find the best and latest stock. 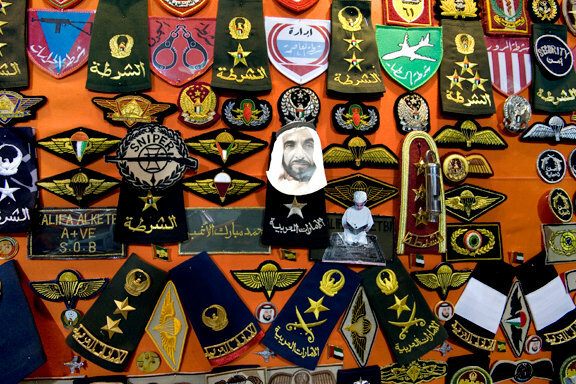 “Look at the quality,” Maher says, holding two ostensibly identical metal insignia for a paratrooper’s uniform, a golden parachute with wings. It is only on closer inspection that the visible and tangible differences in their colour, finish, and casting become evident. As his father’s deputy general manager, Maher is also responsible for expanding the business, something that has taken Technical Scissors in new and unexpected directions. Since 2007 he has worked to develop Micam, a range of Nato-standard products that are effectively Technical Scissors’s own brand, and more recently, the company has started supplying uniforms for the building and hospitality industries. The company’s biggest growth market, however, is school uniforms. As with so many things in the UAE, the Owaimers believe the nation’s youth hold the key to the future. The scion of the Owaimer business empire then lets Technical Scissors’s latest corporate secret slip. Technical Scissors’s target market may have shifted but the family’s ambition is undiminished. In military terms their aim might be described as full-spectrum dominance, but for Maher it’s just business – and the future is elementary.